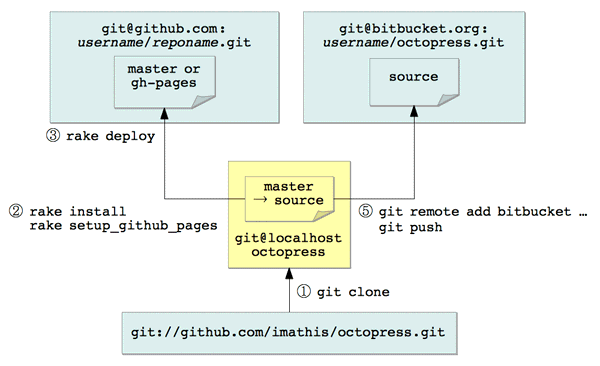 Publishing an OctoPress Site on Shared Hosting is not that difficult than it sounds. As we Can use Git Push on shared hosting services, basically it is as easy as we do on our Cloud Server. Some Preliminary Knowledge, however is required around the things. Shared Hosting Providers like Hostgator uses VirtFS or Jailed Shell – a Shell with limited function. Second thing one need to know is – How to Use Git Repo In Shared Hosting Account. Practically, we will do the exactly same steps like we did while Installing Octopress on Openshift PaaS. The authenticity of host '[140.258.189.20]:2222 ([192.254.189.28]:2222)' can't be established. RSA key fingerprint is bb:6a:51:b4:63:e8:3b:a1:c9:c8:29:3f:b9:1b:4e:49. Warning: Permanently added '[140.258.189.20]:2222' (RSA) to the list of known hosts. How you will design the structure fully depends on you. Themes can break, thats where usually is a slight glitch. There are specific fixes available in Github, do a search if you face some issue. This Article Has Been Shared 1885 Times! Private Cloud Computing though has penetrated the IT industries very well, other stock market influencer brands like Audi, Dailmler adapting it as well. Play Rackspace Cloud Files Streaming Video on VLC Player on your Windows PC or Mac very easily. The Speed of Akamai Edge Servers will be apparent when playing. All Four IT Revolutions – Internet of Things (IoT), Software-Defined, Network virtualization and Big Data are powered by Cloud Computing. Cite this article as: Abhishek Ghosh, "Publishing an OctoPress Site on Shared Hosting," in The Customize Windows, July 15, 2014, April 21, 2019, https://thecustomizewindows.com/2014/07/publishing-octopress-site-shared-hosting/.